TNFa (Tumor necrosis factor), is mainly secreted by macrophages and can induce cell death of certain tumor cell lines. It has been reported that TNFa can inhibit the proliferation and induce apoptosis of A549 cells, besides, the concentration of IL-1β and IL-8 in cell supernatant will increase after stimulation. 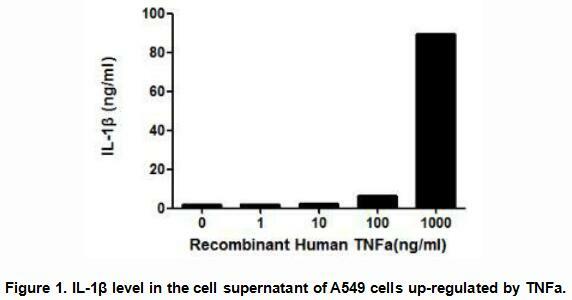 Therefore, a stimulation assay of TNFa was conducted using A549 cells. 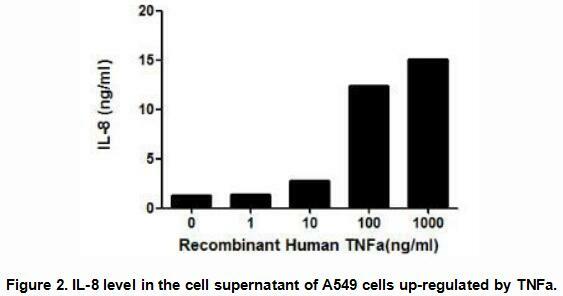 Briefly, A549 cells were incubated in DMEM with different concentrations of TNFa (1ng/mL, 10ng/mL, 100ng/mL, 1000ng/mL) for 8h, after which the concentration of IL-1β and IL-8 in the cell supernatant were detected by ELISA. IL-1β and IL-8 levels in the cell supernatant of A549 cells increased significantly after stimulated with IL-1β, the data was shown in Figure 1 and Figure 2 separately. Figure. Western Blot; Sample: Recombinant TNFa, Human. 蛋白質溶於20mM Tris, 150mM NaCl, pH8.0, containing 1mM EDTA, 1mM DTT, 0.01% SKL, 5% Trehalose and Proclin300 為冷凍乾燥包裝。使用前Reconstitute in 20mM Tris, 150mM NaCl (PH8.0) to a concentration of 0.1-1.0 mg/mL.避免vortex. 短期保存Store at 2-8°C for one month.分裝-80°C長期12 個月。請避免反覆冷凍解凍。. APA133Hu01 Active Tumor Necrosis Factor Alpha (TNFa) Cell culture; Activity Assays. RPA133Hu01 Recombinant Tumor Necrosis Factor Alpha (TNFa) Positive Control; Immunogen; SDS-PAGE; WB. PAA133Hu01 Polyclonal Antibody to Tumor Necrosis Factor Alpha (TNFa) WB; IHC; ICC; IP. LAA133Hu81 FITC-Linked Polyclonal Antibody to Tumor Necrosis Factor Alpha (TNFa) WB; IHC; ICC; IF. LAA133Hu71 Biotin-Linked Polyclonal Antibody to Tumor Necrosis Factor Alpha (TNFa) WB; IHC; ICC. MAA133Hu22 Monoclonal Antibody to Tumor Necrosis Factor Alpha (TNFa) WB; IHC; ICC; IP. MAA133Hu21 Monoclonal Antibody to Tumor Necrosis Factor Alpha (TNFa) WB; IHC; ICC; IP. LAA133Hu72 Biotin-Linked Monoclonal Antibody to Tumor Necrosis Factor Alpha (TNFa) WB; IHC; ICC. MEA133Hu Mini Samples ELISA Kit for Tumor Necrosis Factor Alpha (TNFa) Enzyme-linked immunosorbent assay for Antigen Detection. SEA133Hu ELISA Kit for Tumor Necrosis Factor Alpha (TNFa) Enzyme-linked immunosorbent assay for Antigen Detection. AEA133Hu ELISA Kit for Anti-Tumor Necrosis Factor Alpha Antibody (Anti-TNFa) Enzyme-linked immunosorbent assay for Antibody Detection. HEA133Hu High Sensitive ELISA Kit for Tumor Necrosis Factor Alpha (TNFa) Enzyme-linked immunosorbent assay for Antigen Detection. SCA133Hu CLIA Kit for Tumor Necrosis Factor Alpha (TNFa) Chemiluminescent immunoassay for Antigen Detection. PSA133Hu01 Antibody Pair for Tumor Necrosis Factor Alpha (TNFa) ELISA; CLIA; ELISPOT; Luminex; Immunochromatography and other Immunoassays. KSA133Hu01 ELISA Kit DIY Materials for Tumor Necrosis Factor Alpha (TNFa) Main materials for “Do It(ELISA Kit) Yourself"